The term “grub” is often used to designate the larval stage (immature stage) of an array of lawn-damaging insects. In Idaho, the most common and destructive is the billbug and the white grub. Billbug adults are gray, brown, or black with a hard shell and curved snout. Larvae are white with a brown head, curved, legless, and the size and shape of a large grain of rice. Billbugs develop through a single annual generation. They overwinter in the soil mostly as adults and emerge from the soil when spring temperatures warm to about 60 degrees. 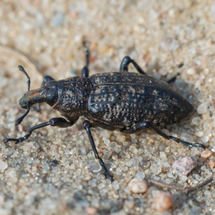 Billbug adults can be found crawling on sidewalks from mid-May to mid-June. After mating, adult females deposit eggs inside grass stems. Within a few days, larvae hatch and begin feeding. Larvae are abundant from mid-June to late August. Larvae pupate in the soil and emerge as adults during July. These adults overwinter to repeat the life cycle in the spring. Billbug grub damage looks very similar to drought stress and it is easy to conclude that a grub damaged lawn is simply not getting enough water. Some signs are the development of brown or tan discolored areas, thinning of the grass, and large patches of lawn dying. Damage is usually more severe at lawn edges next to driveways, sidewalks and roads. 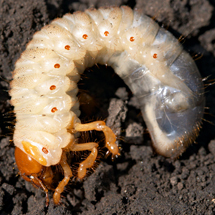 White grubs are the larvae stage of a beetle known as scarab beetle or more commonly as May/June beetle and masked chafers. White grubs have a characteristic “C” shape and are creamy white with three pairs of legs. They grow to a size of up to 1 to 1¼ inches long. White grubs feed on grass roots causing severe wilting and eventual death of affected areas of lawns. The sod will tend to lift away when pulled but grass blades will generally stay intact since the grubs have mainly eaten roots. Additionally, skunks and raccoons in search of larvae will cause considerable damage as a result of their digging and feeding on grubs. Grubs are generally found in the top inch or so of the soil and will go much deeper during the winter months. Masked chafer grubs have a one-year life cycle overwintering as larvae with the adults emerging in mid to late June. The May/June beetles on the other hand have a three-year life cycle with adults emerging in May and June, laying eggs and the larvae feeding during the summer then overwintering. The second year, when most of the damage occurs, the grubs feed throughout the summer. In the third year, the grubs complete their development in the spring and early summer, forming pupae and adults the following year to start the cycle again. Several species of sod webworms or “lawn moths” commonly infest home lawns. These include the silver-striped sod webworm, the bluegrass sod webworm, and the larger sod webworm. Sod webworm larvae can cause major damage to residential turfgrass, especially during periods of drought. Sod webworms overwinter as mature larvae in their silken tunnels. Larvae resume feeding in the spring and then pupate from late May through early June. Young pupae are approximately ½ inch long, pale yellow, and eventually turn brown prior to adult emergence. Larvae feed from July through early August then pupate. Adult moths emerge 10 to 14 days later. Sod webworm larvae damage often is observed as brown patches up to the size of a baseball in the lawn. In some instances, the brown patches are punctured with pencil-sized holes, a result of birds searching for the webworm burrows. Feeding damage from sod webworm larvae frequently goes unnoticed during periods of drought. The most severe damage usually occurs in July and August.